Grinding your own coffee beans right before using them is the best route to an amazing cup of coffee, but many people don't own a grinder. What's more, coffee is something that most people want to grab and go without having to employ precise and technical methods. If you love the taste of freshly ground coffee but you don't want to spend time manually grinding beans each morning, the best solution for you is to get an automatic coffee maker with a grinder. Here are some of the benefits of having a machine with its own grinding mechanism. The reason that so many people stick with automatic coffee makers is they're easy to use and are virtually foolproof. When you pick one with a grinder, the convenience is bumped up a level and you'll get coffee that's far superior to your average cup. The best coffee maker with grinder models have burr grinders, which result in uniform sized grounds and make a more well rounded and richly flavored brew. 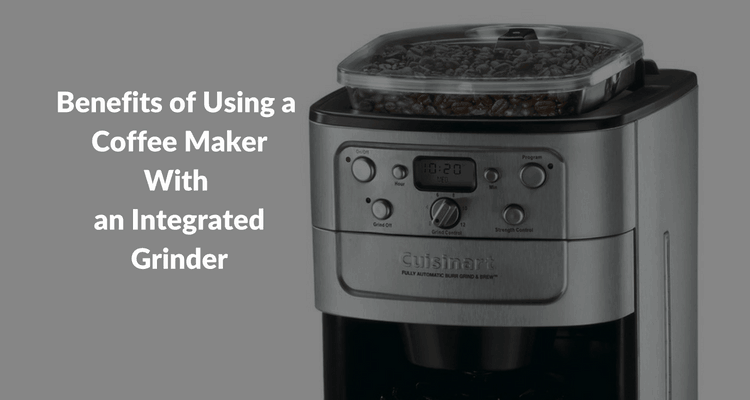 You don't have to put in any muscle to use coffee makers with integrated grinders, you only need to use your favorite whole beans. The machine will take care of the work, and then it's just a matter of choosing your preferred settings and waiting for the coffee to brew. As mentioned above, the best coffee maker with grinder models utilize burr grinders, and this allows you to have greater control over your finished cup of brew. As opposed to blade grinders, which produce grounds with a widely varied and uneven size, a burr grinder makes uniform grounds. The size of the grind that you choose on your machine can help determine the strength of the finished brew. If you like very strongly flavored coffee, go with a finer grind. We've all had coffee that tasted stale, and there are usually one of two culprits behind the problem: a machine that needs a good cleaning or old coffee beans. The latter is typically the problem, as people tend to buy pre-ground coffee that's been sitting on store shelves for who knows how long. When you grind your own beans with a coffee maker that has an integrated grinder, you're guaranteed a fresher tasting drink. If you really want to take your coffee up a notch, try roasting your own beans at home before putting them in the machine. Even if you don't have the time or space to do so, you'll notice a huge difference between coffee made with whole beans ground just before brewing and coffee made with typical pre-ground beans. How flavorful a cup of coffee is depends largely upon how much of its oils can be extracted during brewing and the method used to extract the oils. The aromatics and volatile compounds in coffee are exposed as soon as the beans are ground up -- this is why pre-ground coffee goes stale so much faster than whole beans. When you use a machine with its own grinder and process whole beans right before brewing, you get the full flavor potential of the coffee and it's incomparable to anything else. I can't seem to find where to search on your site. Looking for an integrated espresso and thermal carafe coffee maker that grinds too. Hi Jan, I'm not aware of such machine. Maybe you should buy a different machine for each purpose.